I know… Extra time doesn’t exist anymore. And that’s why we are going to fill in the blank with pictures (and a modicum of words) so you get why IssueLab, one of the largest repositories for social sector research is open, at aglance . IssueLab is open in order to enable free access to the full text of the social sector research we collect and preserve. We make it easy for anyone to discover insights and analysis about the social world we share and ideas and strategies about how to make it better! Add your knowledge now! We’ll walk you through each step of why we’re open. IssueLab is open in order to mainstream and showcase the social sector’s evidence base. One way we do this is with our topical special collectionswhere knowledge seekers can deep-dive into an issue and discover interdependencies across issues. We never tire of featuring knowledge or making it more relevant. 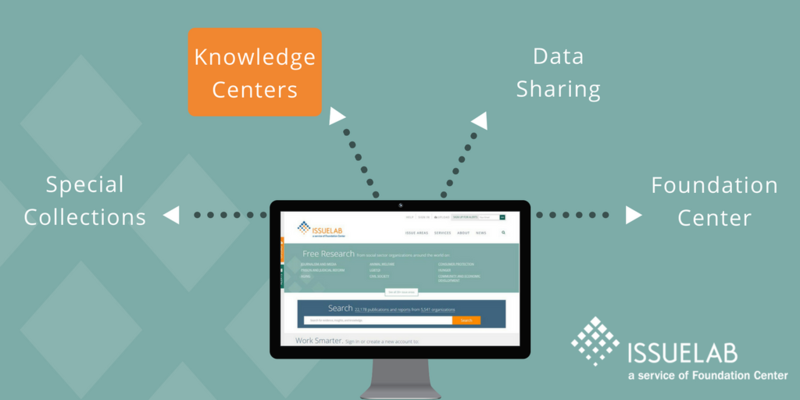 IssueLab is open in order to make it simple for social sector organizations to create their own open access institutional repositories through our Knowledge Center Service. Use it to quickly create and share an e-library drawing on IssueLab’s collection, your own collection, or a combination of the two. Promoting the work of nonprofits and making it easy to find is our speciality. IssueLab is open in order to freely share the metadata we hold through our data provider services. Grab our openly licensed data and share it with your audience wherever it is! Nonprofit research becomes searchable and browseable on IssueLab. IssueLab is open in order to support the many practitioners and funders who use other Foundation Center services such as Foundation Center’s grant-seeker tools, mapping tools, and issue landscapes. Just one more way that our open access status lets us bring IssueLab’s content to knowledge seekers where they live. Foundation Center platforms create even more visibility for our publishers.